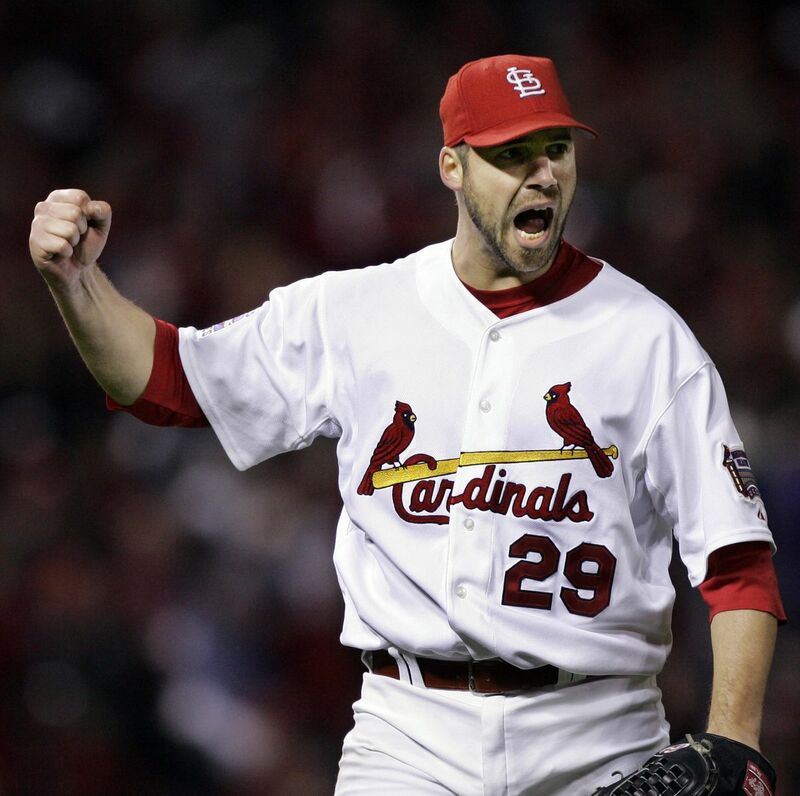 In December of 2002, Walt Jocketty signed Chris Carpenter to a league-minimum contract. Already out for the entirety of the upcoming 2003 season, it’s hard to imagine a more under the radar move. It turned out to be one of the most influential of Jocketty’s career and important in the history of the Cardinals. Finally healthy, Carpenter went 15-5 with a 3.46 ERA in 2004. While those numbers look rather pedestrian in today’s game, his ERA+, which accounts for the run-scoring environment, was 122. Carpenter was 22% better than league average in his first season back from injury. Unfortunately, he strained his bicep on September 18 and didn’t pitch the rest of the season or the postseason. Healthy again in 2005, Carpenter asserted himself as the leader of the Cardinals staff. In his first full-season of work since 2001, Carpenter went 21-5 with a minuscule 2.83 ERA in an astounding 241 innings pitched. According to ERA+ (150), Carpenter was 50% better than league average. Before being named the NL Cy Young winner in November of 2005, Carpenter began to build his postseason resume by going 2-0 in three postseason starts. In 2006, Carpenter absolutely dominated at Busch III, posting a 1.81 ERA at home in over 124 innings. Carpenter lost a potential clincher in Game 6 of the NLCS at Shea Stadium, but was redeemed by Jeff Suppan, Yadier Molina, and a famous curveball. He came back in Game 3 of the World Series and pitched a gem, going 8 shutout innings on a mere 80 pitches (I’ve always wondered why LaRussa didn’t let him finish the game). Carpenter was so dominant, in fact, that he never went to a three-ball count on a Tigers batter that night. Carpenter battled injuries in 2007 and 2008. He had ligament replacement surgery after one start in 2007. After nearly a year and a half of rehab, he was removed from his start in Chicago with a shoulder strain on August 10. Effectively, he lost two years in the middle of his prime. In 2009, Carpenter was finally healthy again, and he had his best season. Carpenter earned his Cy Young award in 2005, but he was even better in 2009, two years removed from frequently pitching. It’s also remarkable, looking back at it, that the duo of Chris Carpenter and Adam Wainwright only led the Cardinals to the postseason once. In 2011, Carpenter started the season 1-7 but finished strong. He had a sub-3.00 ERA in the second half, and on the final night of the regular season, threw a shutout at Minute Maid Park with a Wild Card berth on the line. He won Game 1 of the World Series, pitched decently but lost Game 5, and started and won Game 7 on three days rest after a miraculous rain out. After two years of comeback attempts from Thoracic Outlet Syndrome, Carp finally hung it up in 2013. Before Game 2 of the NLDS against the Pirates, Carpenter took the mound once more in full uniform to throw out the ceremonial first pitch. From someone in attendance that day, it was the highlight as the Cardinals were shut down by Gerrit Cole and lost 7-2. In a six-year stint wearing the Birds on the Bat, Carpenter was so good he’s between Dizzy Dean and Rogers Hornsby, both Hall of Famers. Maybe it’s recency bias, but I think Carpenter earned his spot in the Top 5. World Series champion. Cy Young Award winner. Fierce clubhouse leader. There’s only one pitcher in Cardinals history who checks all three of those boxes. @colingarner22Thanks to Baseball Reference for the statistics and embeddable tables.